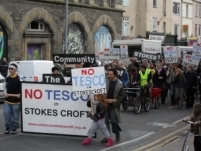 The trouble in Stokes Croft, Bristol on Thursday brought back an old question of why people feel justified in such protest. I’m sure some get a real kick out of standing up to large - and therefore evil - corporations such as Tesco, but for any shop to survive it will require customers. If as suggested people really “don’t need” or “don’t want” the new store then it will close through lack of business. Smaller shops will only be threatened if local people stop using them; that is their choice. It is choice that is really at risk. Protecting the local character? No, these demonstrations are about something else; an attempt by a vociferous minority to impose their will over that of the individual.